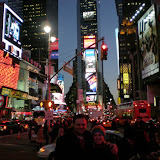 In February we went to New York City with some friends. We saw the Guggenheim, Radio City Music Hall (somewhat interesting), the Late Show w/Letterman (ok), Wicked (ok) and Spamalot (good), ate very well, walked through Central Park, saw other interesting places and generally relaxed. I am happy to say that my Grandpa got married!!!! To a wonderful women named Connie on December 28,2007. My real Grandma died on December 15,2006. Bye!!! Hey it's Maddy! I'm sorry to say that I lost my soccer tournament. We had to play against u-12 girls who had already gone through puberty!!!!! ooohhh well. We did our best. Have a good new year!!!!!!!!!! see ya!!! We live in Pleasant Grove, Utah. Check out our online photo album.